Qualitative risk assessments and quantitative risk assessments have different objectives, whereas a qualitative risk assessment assesses the potential of occurrences of risks or adverse events, a quantitative risk analyses is a mathematical model reflecting the probability of the occurrence of a risk or an adverse event. A qualitative risk assessment does not attempt to assign hard financial values or assets, expected losses, loss of control etc. Instead relative values are being calculated which may include indicative cost and loss values. Qualitative risk assessment due to its very nature requires multiple inputs from various parties for a comprehensive evaluation of the risks, and consequences of adverse events. A quantitative risk analyses can be performed by a single person since the potential risks have been identified but require a probability factor. A qualitative risk assessment can be conducted through a combination of questionnaires and collaborative workshops. The participants i.e., the review team, should be a representation of all relevant aspects of the organization of the enterprise, and should all be adequately familiar with the enterprise objectives. For clarity, in this narrative, an enterprise has been defined as efforts performed in a strategic manner for achieving a perceived objective, and thus can apply to a business, an existing plant, part of an existing plant, a project, or part of a project, It can be applied in its entirety to the whole enterprise, as well as to specific parts, sections or stages of the enterprise. Is the work completed in time, i.e., on schedule ? Is the work completed within the allocated funding, i.e., within budget ? Does the quality of the services and material to be delivered under contract meet the technical requirements, i.e., is it in compliance with the contract specifications, applicable standards and codes ?. Table 2.1 provides a guide for assessing the potential financial risks. It is recommended to identify potential operational and financial risks, prior to starting an enterprise. A Risk Management Plan (RMP) should be part of an Enterprise Execution Plan. Risk Management topics should address issues such as, enterprise risk, management deceptions, loss of capital, equipment theft, earthquake, construction safety, political risk, privacy, workplace violence, and strikes. This narrative presents a methodology for conducting a Qualitative Risk Assessment, how risks can be identified, evaluated and mitigated or avoided, in a consistent and systematic manner. For assessing potential hazards that may occur as a result of a design weakness, or an inadequacy pertaining to operating safety, a HAZOP (Hazard Operability) review can be conducted. For HAZOP review practices, refer to the HAZOP workshop section. Sequence of activities addressing particulars, pertinent to establishing a RMP, are addressed on a step-by step basis as shown in the “Risk Assessment Process Diagram” shown under “Services/Qualitative Risk Assessment - Risk Assessment Diagram”. The objective of Risk Management is minimizing the probability and severity of adverse events on an enterprise. 3.1 Stakeholders - A “Stakeholder” can be defined as: “Any person, group, or entity that can place a claim on the organization’s attentions, resources or output, or is affected by that output”. Thus, within the frame of this definition, a ‘Stakeholder’ can place a claim on the organization’s resources, and hence is to be considered a source of risk. 3.3 Risk - Exposure to the chance of an adverse effect, e.g. human injury, adverse environmental effects, loss of production, loss of capital, adverse effect on reputation, negative effect on project execution etc. 3.4 Deviation - Any event that causes an offset of the intended use of a piece of equipment, system, procedure or objective. A deviation is often a potential initiation of a risk. 3.5 Risk Management Planning - This is the process of how to plan for the Risk Management activities for an enterprise. 3.6 Risk Identification - This activity involves identification of potential adverse events that may affect the enterprise. 3.7 Qualitative Risk Assessment (QlRA) - This is a exercise on how to assess the probability (P) of an adverse event and it severity (S). Both will be used to determine the relative importance of the potential adverse event. 3.9 Risk Response Plan (RRP) - The process of developing options and determining actions to reduce adverse events, that may affect the enterprise. 3.10 Enterprise Plan Risk (EPR) - This is a business risk, i.e., an uncertain adverse event or condition that, if it occurs, has a negative effect on an enterprise plan objectives. 3.11 Guideword - Help for indicating a deviation, a concern, or a cause. 3.13 EIA - Environmental Impact Assessment on plant or factory premises, surrounding community/local population local area biotopes e.g. agricultural premises, vegetation, wildlife, surface water and aquifer etc. A risk (R) can be quantified by the following simple equation R = P X S.
As the importance of the risk (R) is determined by combining both, the probability (P) of the event to occur and its severity (S). The costs associated with “R” can be compared with costs, related to (additional) contingencies, investments or expenses, pertaining to preventive maintenance and/or inspection, for achieving a lower risk level. 3.15 Risk Matrix - The Risk Matrix (Table 2.3A,. demonstrates a combined result of the likelihood or Probability (P) of an event and the severity(S) or Impact of its consequence. The “Risk Matrix” is the base on which management can decide on the necessary “Mitigating Action” to be taken as a “Response”. The Risk Matrix therefore is the ‘driver’ to conclude a “Response Table” (Ref Table 2.3A) which is a scorecard that directs the mitigating actions on the basis of an overall risk category and risk level the organization of the enterprise (i.e. stakeholders) can accept. Severity (S) relative to the probability (P) can be defined as measures of loss of business revenue, production, assets, equity and costs incurred from repairing equipment and/or cleanup of the area and environment as well as potential damage claims. Known or identified risks must be addressed in Risk Management Planning. Unknown risks cannot be planned. However based on experience, these risks can be covered by adding contingency. What is the potential adverse event.? What is the probability of the adverse occurring? What will be its severity should it occur? The results of the meeting should be recorded in a systematic manner similar to a HAZOP review meeting. Attachment 2.1 Qualitative Risk Assessment Worksheet can be used for recording the results of the meeting. Risk Management Plan defines how to approach and plan the risk management activities for an enterprise. The plan indicates how risk identification, qualitative assessment, response, monitoring and control will be performed during execution. Assessment - Defines the tools and data sources to be applied as appropriate in risk management. This depends on Enterprise Plan stage, the available data and information, as well as the response options. Responsibilities - Definition of the Role and Responsibility of each team member of the Risk Management Team. Budget - Establishment of a budget for Risk Management in the Enterprise Plan. Timing - Defines the frequency and / or stage when a Qualitative Risk Assessment must be conducted. Scoring and Interpretation - Defines methods and criteria to be applied for Risk Quantification and Qualification. Thresholds - Defines criteria for actions to be taken on risks. Reports - Defines the format of Qualitative Risk Assessment results will be recorded, analyzed and relayed to the team. These documents show the adverse events of all risk related data and information and how the risk data and activities were addressed and dealt with. It also addresses future needs and lessons to be learned as how risk processes can be audited. List uncertain events which have negative effects on the Enterprise. Any enterprise constitutes a potential risk. Therefor it is essential to establish a risk acceptance level identified as “As Low As Reasonably Practical” (ALARP). The boundaries of the ALARP is in the ”Moderate Risk zone”, The high ALARP level has been identified ALARP 1, which borders the High Risk red zone; the low ALARP level is has been indicated by ALARP 2, which borders to the Low Risk green zone. 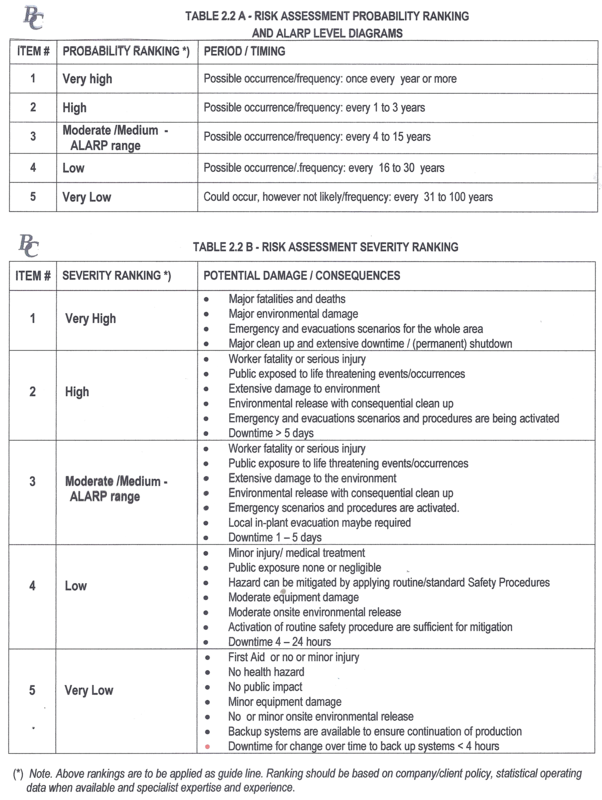 The ALARP levels relevant to the probability are shown in Table 2.3B. Table 2.3A shows the impact from success to failure in on a numerical (non-linear) and ordinal scale. .
6.3 Resources for risk identification. People that have been exposed to, or that have encountered the event that is being considered, on previous several occasions, are considered a reliable source in visualizing the probability of the potential adverse event and its severity..
Assumptions based on experience and interpretation of historical data. This approach is to be left to the end and considered as a last resort to complete the requirements for the analysis. All effort is to be made to arrive to a logical and rational assumption. Wild guess. This term is self explanatory. Assessment results obtained by using statistical records are considered the most reliable. A “wild guess” would demonstrate a least reliable exercise, whilst those based on the ‘expertise judgment’ could be satisfactory. The impacts on (Business) Case objectives can be scaled from very low to very high ordinal scale or on a numerical scale. The numerical scale shown here is nonlinear, indicating that the organization wishes specifically to avoid risks with high and very high impact (Table 2.3A). When an abundance of statistic data is available, the statistics can be used for probability assessment calculations. In general the Normal Distribution mode would be the most practical for decision making. Minimum - An optimistic estimate of what might happen assuming that everything goes about as well as possible. Most likely - This is the estimator’s best guess. An estimate that is likely to be right more often than any other. It is the "Mode", in statistical terminology. Maximum - A pessimistic extreme, assuming that the worst case tends to occur. Refer to “Services/Qualitative Risk Assessment”-Action #5”. The Risk Response Plan addresses options available for such as, reducing or avoiding potential adverse events to reach the Enterprise Plan objective. Adopting a technology that is more familiar. Shifting areas of potential risk to 3rd parties that have more experience or expertise in dealing with the specifics of the potential risk. Taking early (diverging) actions for changing or reducing the probability of a potential event, or reducing the severity to an acceptable level. Taking early action may reduce the probability of an adverse event. This may be more effective than taking corrective actions as the risk event occur. Develop a Contingency Plan defining the actions to be taken as well as providing the contingency funding and professional liability insurances. Refer to “Services/Qualitative Risk Assessment – Risk Assessment Diagram - Action 6”. It is vital that a risk control report to the enterprise manager and the risk team leader states the effectiveness of the response plan being followed, and if any, what corrective actions are required. Enterprise change requests due to frequent preventive and/or corrective actions. Risk data should be gathered and analyzed to form the basis for risk lessons to be learned and for future risk identification and risk response plans. Refer to “Services/Qualitative Risk Assessment – Risk Assessment Diagram - Action 7”. The Risk Close-out Report shall be incorporated in the final Enterprise Execution Plan.